Caregivers working with senior clients who have dementia may find themselves in situations where talking leads to frustration. Something like mentioning a loved one that a client may have trouble remembering or a task like visiting the doctor can spike confusion for the client and become difficult for both of you to understand one another. The app appropriately called Communication Tool offers senior caregivers and their clients the ability to communicate using pictures about family members, foods & drink, personal care, etc. Images can be powerful as they serve as a sort of universal language. Seniors with dementia don't need to remember the exact words for what they need using the Communication Tool app. Instead they can simply pull up a photo of what they need. For example, under the personal care section of the app, there are icons of a toilet, a person sleeping in a bed, a pill, etc. If the senior client needs something specific, he/she can easily pull up the image on the app and share it with their caregiver without having to describe their needs verbally. Another use for the photos could be for enhanced story telling. If a loved one comes to visit, such as a grandchild, and wants to tell their grandparent about the new sport he/she's started playing, the Activities area of the app offers action shot icons of different sports. While a senior client may not immediately understand the description of soccer, a photo of a person kicking a ball might jog their memory or at least help them keep up with the story a little better. Users also can take their own pictures and store them in the app for a customized experience. For example, under the people category, users can select Family and take photos of you, spouse, son, daughter, grandchild, etc. to have on hand. Additionally, there's an area for professionals such as doctors, dentists, eye doctors, etc. If a senior with dementia doesn't remember who someone is right away then a caregiver can store that person's photo in the app so next time they have a photo and label in advance. The Communication Tool app is available for Apple platforms. Did you know that the term “assisted living” is the most popular Google search term for senior housing? Certainly more so than “nursing homes” and “senior living”, according to a new senior care analysis. It’s no wonder. Studies show that in 2013, 45% of those who needed long term care and could not age in place chose an Assisted Living Facility (ALF), compared with 20% in 1996. 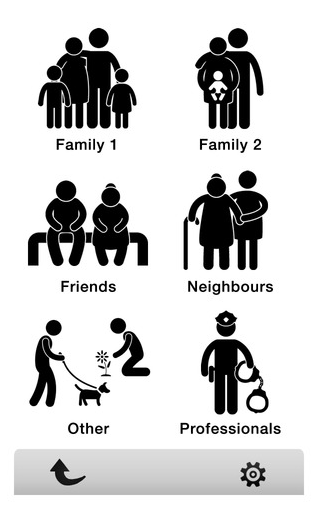 ALFs provide a safe and secure social environment for an aging population. But what is the cost? A recent Genworth 2014 Cost of Care Survey showed that, while the national median average for one Bedroom–single occupancy apartment in an assisted living community is $42,000 per year, that cost can can be much higher (or lower). What drives the difference in cost? Location, location, location. The average cost increase over 2013 is 1.45% and the survey estimates a 5-year cost increase of 4.29%, based on the compound annual growth rate for surveys conducted from 2009 to 2014. Keep in mind that costs vary within state regions, so be sure to look closely at the costs of assisted living in your specific area. Is assisted living in your future? Tell us what you look for in a facility and if the higher cost is worth the location. For many of us, it has been a long, brutal winter. Fortunately the end is hopefully in sight soon. 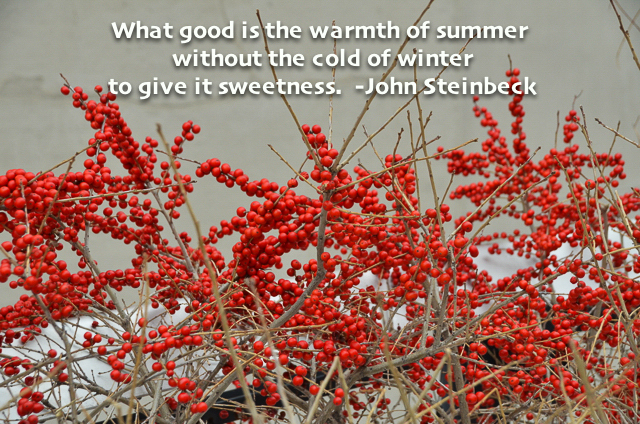 This week's photo was taken on the High Line in New York City and features winter berries. They are a bright spot in an otherwise dreary landscape. Caregiverlist invites you to enjoy the photo and share it with loved ones. At Caregiverlist we know the realities of caregiver stress. Thank you caregivers and certified nursing aides for your hard work and caring for our seniors. Please refer your friends to apply for part-time and full-time job positions on Caregiverlist.com and visit our career center for additional career tools. Stay warm and have a great week. Cruise Ship Retirement: Assisted Living on the High Seas? Last month I read the USA Today story about Lee Wachtstetter, an 86-year-old Florida widow who sold her Fort Lauderdale home (and acreage) and to live a “stress-free, fairy-tale life” aboard Crystal Cruise Line's 11-year-old ship, Crystal Serenity. Retiring as a permanent resident on a luxury cruise ship isn’t cheap. “Mama Lee” estimates she pays $164,000 per year, or about $450 per day, for her lifestyle. That cost includes her single occupancy stateroom, all meals (and the ubiquitous buffets,) beverages, gratuities, housekeeping, cocktail parties, movies, lectures, Broadway-type shows, and her favorite, nightly ballroom dancing — not to mention travelling to every city around the world that has a port. As long as Ms. Lee doesn’t become acutely ill or need special medical attention, which can get pricey on-board, cruise ship retirement seems like a pretty glamorous and exotic way to live out one’s golden years. The Straight Dope’s Cecil Adams tackled this topic in a June 2012 article and compares cruise ship retirement with luxury hotel retirement, except the retiree gets to travel the world instead of being stuck in one place. Temperate climates and nightly sunsets on a vast horizon make cruise ship retirement sound like a better alternative to staid assisted living, but only if the senior is in the best of health and doesn’t mind traveling light. Ship staterooms can be cramped, especially when one is on a budget. Sleeping quarters aside, the entire ship and all its amenities are at your service. While a long-term passenger might miss family and friends, how many receive sporadic visits, at best, when they reside in assisted living facilities? As seniors become more comfortable with technology, they can keep in touch through Facebook and email. Right now, video bandwidth is limited; most ships block or limit Skype. For face-to-face visits, onshore connections using free Wi-Fi in port with a smartphone may be the best route. But what about the actual dollar cost? In 2004, geriatrics doctors Lee Lindquist and Robert Golub published an article in the Journal of the American Geriatrics Society which showed that cruises were priced similarly to assisted living centers could accommodate the needs of seniors and possibly provide a more desirable option to seniors for retirement. In their hypothetical, an 80-year old woman, for example would pay $228,075 in an assisted-living facility compared to $230,497 on a cruise ship over a 20-year time span. More recently, however, Genworth’s 2014 Cost of Care Survey listed Washington, D.C. as the most costly spot for assisted living, with an annual median cost of about $82,600 for a single-occupancy unit. Assisted living costs usually cover room and board, basic utilities (electricity, heat, water, and garbage), basic housekeeping (fresh linens) and some meals, significantly less than the price tag for Ms. Wachtstetter's cruise ship retirement lifestyle. It’s difficult to compare apples-to-apples, but it seems only like the least expensive cruise costs might be similar to a highest-end assisted living community. Have you or a family member ever thought of cruise ship retirement as a viable option? I’d love to hear from assisted living community and cruise ship directors alike as to why theirs is the best retirement option. Or if you happen to read this while on an extended cruise, let us know what that's like. As for me, I think I’d like to summer on land and winter at sea, as long as I can have access to the helipad for quick escapes from either. For caregivers with senior clients on a few different prescriptions, the monthly cost can add up quickly. Insurance may only cover part of the cost of prescription drugs in some cases, and it's hard to compare the prices even under insurance between different pharmacies without checking into the cost at each location individually. The iPharmacy App saves prescription drug users time by comparing prices at various pharmacies near them and also serves as a medication manager, pill identifier and drug search tool. With the rising costs of prescription drugs, caregivers will likely find the price comparison portion of this app the most useful. A quick search of a current medication that a senior client is prescribed may yield surprising results. The first search I did for a current prescription I use showed that Walgreens, my regular pharmacy, has it for a fraction of the price I usually pay because the app offers a coupon. Users can show the coupon to the pharmacist directly from their phone or e-mail or text the coupon to themselves for later use. The app also offers a free GoodRx card that can be sent to users in the mail for future use on discounts. Other app features include the My Meds portion, which allows users to keep track of which prescriptions they're taking, and the reminder feature, which sends users a notification when it's time to take their pills. The pill identifier area of the app asks users to enter identifying details on prescriptions they may have lost the label for, such as imprint, shape and color to figure out what medication it is. Users should take caution in using this portion of the app, particularly if the app identifies the pill as something they've never been prescribed. If there's continued uncertainty as to what a pill is or is used for, consult a pharmacist for verification. The app also offers information on drug recalls and a nearby pharmacy search for users. While the app did crash unexpectedly a few times during use, it still provides an all-emcopassing and well organized prescription management and search for caregivers and their senior clients. 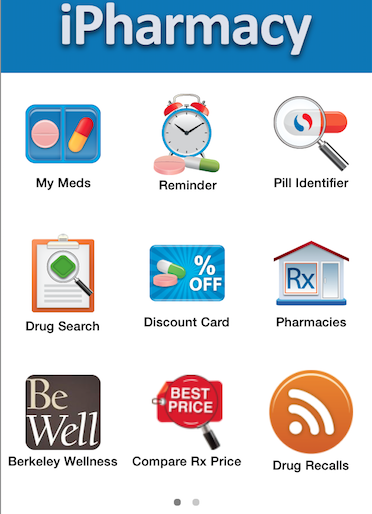 The iPharmacy app is available for Apple and Android platforms. Where will you be Sunday night? If you are like me and millions of viewers (43 million last year), you will be watching the 87th Academy Awards. Are you rooting for Birdman or Boyhood? Will Eddie Redmayne take Best Actor for channeling Stephen Hawking in The Theory of Everything? Who will win the Oscar for Best Actress? My money’s on Julianne Moore in Still Alice, in which she portrays a professor diagnosed with early-onset Alzheimer's. Movies can be entertaining, informative, arresting. They have the ability to comment upon an aspect of society and, when done well, evoke great empathy. 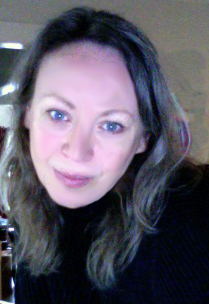 Seniors experience ageism, discrimination, and prejudicial attitudes every day (I pity the fool who will condescends to call me “cute” when I hit 80.) Every year since 2011, the Assisted Living Federation of America (ALFA) sponsors a short film competition (under 9 minutes) about the challenges faced by older adults when they are marginalized by a society that values youth above all things. Demonstrate how individuals can change their attitudes and behavior towards older adults. Keith Rivers, principal/creative director at Workhouse Creative! won the 2014 ALFA Short Film Competition on Ageism with his short story documentary, Salt & Pepper. Second place winner was A Father to Dye For , directed by Lena Nozizwe and starring retired history professor, Hulme Thamsanqa Siwundhla, Ph.D.
ALFA is the largest national association dedicated to senior living communities and the seniors and families they serve. Since 1990, ALFA has championed choice, accessibility, independence, dignity, and quality of life for all seniors. ALFA is now accepting entries for the 2015 Short Film Competition. The submission deadline is 5:00 p.m. EST on March 30, 2015. At Caregiverlist we understand the realities of caregiver stress. We invite you to take a moment to relax and enjoy the photo and inspirational quote and share it with loved ones. 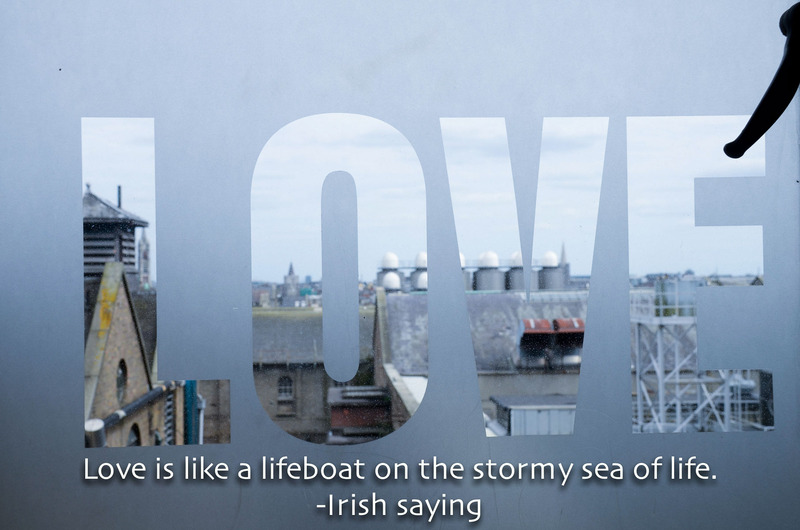 This week's photo was taken from a window of the Guinness Storehouse in Dublin, Ireland. Thank you caregivers and certified nursing aides for your hard work and caring for our seniors. Senior care training assists caregivers to better manage a senior's care needs and manage caregiver stress. Have a great week and stay warm. Seniors are using technology in all its aspects to improve their lives. Cell phones can also be medical alert devices. Email is a way to keep in touch with family and friends far away. Skype is the video phone promised in yesterday’s sci-fi movies. It’s no wonder that seniors are now one of the fastest growing demographics in the online dating game. In the spirit of Valentine’s Day, US-based technology advisory company iTOK sent out a survey asking their members to discuss their online dating habits. Their findings? 1 in 5 seniors have tried online dating, with the largest group of respondents ( 36%) falling between 66 and 75 years old. And they’re not necessarily looking for lasting love, either. Seniors seeking companionship and casual relationships found their way primarily to Match.com, eHarmony, and OurTime (a dating site that caters to singles 50 and older). Fifty percent of iTOK responders were already married; 19% reported being widowed, 18% divorced, 11% single, and 2% currently dating. AARP got into the game when they partnered with an online dating service and came up with HowAboutWe. As in, “How about we” take in a movie tonight? Take a baking class together? Although in my experience, most of the men seem to be under 40 years old. Not that there’s anything wrong with that. However, they are all so good looking according to their online profile photos, I have a hard time believing that a 32 year-old Javier Bardem-looking Jared would want to “hang out and hear bluegrass while drinking whiskey” with a 50-year-old woman. But perhaps I’m wrong. Certainly my Valentine’s-addled mind would love to think so. At the risk of sounding alarmist, I might even run a background check on someone before I committed to a relationship. I know, I’m a hopeless romantic. There are a lot of scammers out there. I strongly advise to take care in all things — especially matters of the heart, where the head tends to lose. When unforeseen health situations that arise, senior caregivers may not know exactly what the issue is or the appropriate first aid response. The most important response in a health emergency is to remain calm, call 911 and follow the instructions of the operator. To help identify health issues and emergencies, The Red Cross First Aid app offers descriptions of the symptoms of common health issues, first aid guidelines and prevention tips. 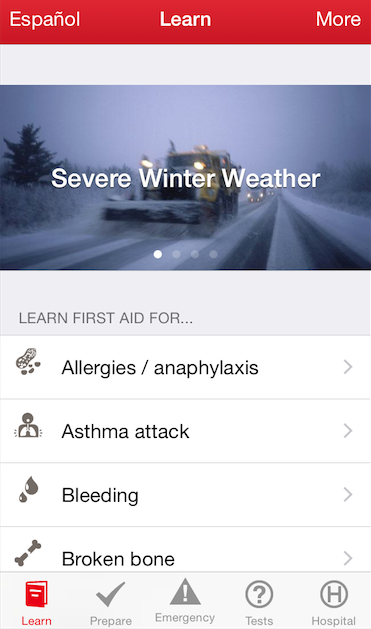 When users open the app, they find a menu displaying a list of topics to learn first aid for, ranging from minor to severe, such as Asthma Attack, Heart Attack and Stings / Bites. Before looking through every topic, caregivers with new senior clients can spend some time learning about the specific health issues that could arise by talking with him/her about any previous health related treatments, pertinent family health history and concerns their doctor may have regarding his/her health. Once a caregiver selects a specific topic, the next screen shows a list of steps for first aid. The steps include a list of symptoms to verify the situation and then a list of actions to take. Within the app along the bottom bar, a center button indicates "Emergency" and includes a list of only emergency first aid for situations such as chocking, diabetic emergency and unconsciousness. Once caregivers familiarize themselves with the appropriate first aid response steps for various situations, they can visit the Tests area of the app on the bottom bar to quiz themselves on what they've learned. If caregivers spend ten minutes learning about the correct response for two different situations a day, it would take less than a month to cover all of the situations presented by the app. A hospital tab on the bottom bar also shows users the hospitals closest to them in case they need to visit an emergency room and are unsure of the nearest location. The Red Cross First Aid app is also available in Spanish as an additional resource. The Red Cross First Aid app is available for Apple and Android platforms. Will Wisconsin Seniors Pay More for Drugs? For the second time during his tenure, Wisconsin State Governor Scott Walker is proposing to cut the state’s popular SeniorCare prescription drug program by requiring Wisconsin's seniors to first enroll in the federal government’s Medicare Part D prescription coverage. The majority of elderly in Wisconsin like the system the way it is. Some 85,000 SeniorCare members across Wisconsin pay a yearly $30 enrollment fee as well as co-pays of $5 for generic drugs and $15 for name-brand drugs, with no gaps in coverage. Medicare Part D can cost $30-$40 monthly and many plans include deductibles. Governor Walker’s office disagrees. "In some cases, SeniorCare deductibles are higher than Medicare Part D," Laurel Patrick, a spokesperson for Gov. Walker, wrote in a statement to 27 News, Madison, WI. "Also there is a provision under SeniorCare that requires some individuals to spend down their income, which means they need to pay for prescription drugs out-of-pocket in order to reach eligibility levels, that makes it less beneficial for many seniors." The governor’s plan calls for seniors to first enroll in a Medicare Part D plan and SeniorCare would supplement coverage for any drugs not covered by the federal plan. His office estimates a $15 million, or 40 percent savings over the next two years in the state’s budget for the prescription drug program for low-income seniors. Gov. Walker first proposed a similar plan in 2011. At that time, the proposal was dropped when it faced opposition from both Democrats and Republicans. It’s interesting that when so many want less federal intervention and more statewide control, a state program with so much local support, especially when, during fall campaigns, elected lawmakers voiced their "commitment(ment) to fully fund SeniorCare." Currently, Democrats Sen. Dave Hansen and Rep. Eric Genrich are launching a petition to drop the proposal. They suggest the Republican governor is "putting the interests of big pharma above Wisconsin's seniors." AARP also denounces the plan, urging Wisconsin members to contact state legislators to encourage them to remove the provisions from the governor’s proposed budget.